NATO leaders to meet in London in December - SABC News - Breaking news, special reports, world, business, sport coverage of all South African current events. Africa's news leader. 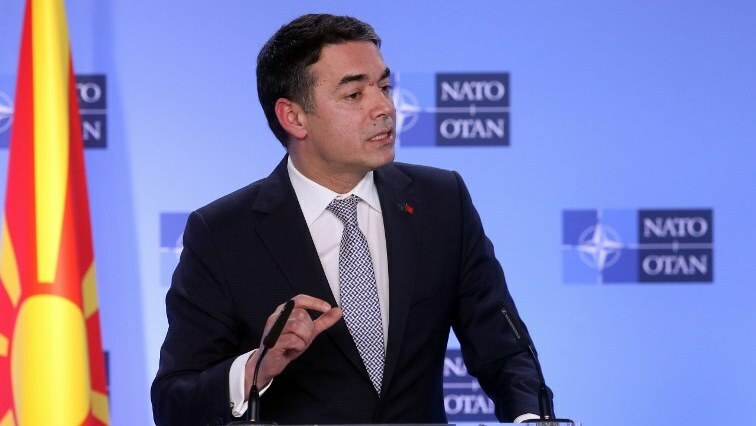 Macedonian Foreign Minister Nikola Dimitrov speaks as NATO Secretary General. The leaders of NATO’s 29 countries will gather in London in December for a special meeting to mark the alliance’s 70th anniversary, Secretary General Jens Stoltenberg announced Wednesday. Stoltenberg tweeted that the British capital was “the ideal setting to mark 70 years of transatlantic military cooperation, as the home of NATO’s first HQ back in 1949”. Britain is due to leave the European Union on March 29 and the December meeting will be seen as a signal of solidarity between NATO and the UK — which is the continent’s leading military power, along with France. “Brexit will change the United Kingdom’s relationship to the European Union but it will not change the United Kingdom’s relationship to NATO,” Stoltenberg said. NATO chiefs will be hoping to avoid the high drama of last year’s summit in Brussels, when US President Donald Trump launched a blistering attack on allies, in particular Germany, for not spending enough on defence. There had been talk of holding the leaders’ meeting in Washington — where NATO’s founding treaty was signed — but, amid fears of a new transatlantic bust-up, foreign ministers will gather in the US capital in April instead. Estonia also offered to host the December meeting. “The meeting in London will be an opportunity for Allied heads of state and government to address the security challenges we face now and in the future, and to ensure that NATO continues to adapt in order to keep its population of almost one billion people safe,” Stoltenberg said in a statement. Though it will gather the alliance’s top leaders for talks, the meeting will not have the formal status of a summit. NATO summits are usually held every two years and conclude with a formal, binding statement of aims and actions agreed by all allies — such as the 2014 agreement to try to spend two percent of GDP on defence. It is yet to be confirmed whether a statement will be issued at December’s meeting, but one was not given at the last such gathering in Brussels in 2017. British Prime Minister Theresa May welcomed the announcement. “December’s meeting is an important opportunity to determine the steps we must now take to modernise the Alliance and ensure its continued success,” May said in a statement. The anniversary comes at a delicate time for NATO. Tensions with Russia are at a high not seen since the Cold War. Concerns linger about Trump’s commitment to the alliance and his willingness to honour its mutual self-defence pact. From the US side, Trump has been unstinting in his criticism of NATO’s European members, accusing them of freeloading on the protection offered by the US military while not spending enough on their own armed forces. Before taking office Trump called NATO “obsolete” and soon after July’s tumultuous summit he questioned whether the US would honour the alliance’s founding principle of mutual defence for newest member Montenegro. The doubts over America’s commitment to defend Europe come as a landmark Cold War arms treaty crumbles, prompting fears of a new arms race on the continent. The US last week began the process of exiting the Intermediate-Range Nuclear Forces (INF) Treaty, saying that Russia has been violating the pact through a new missile system for years. In his State of the Union address on Tuesday, Trump vowed to outspend Russia on new missiles unless a new global arms treaty could be agreed. This entry was posted on 06 Feb 2019,03:39PM at 3:39 PM and is filed under World, News, Homepage Latest Stories Slider. You can follow any responses to this entry through the RSS 2.0 feed. Both comments and pings are currently closed.